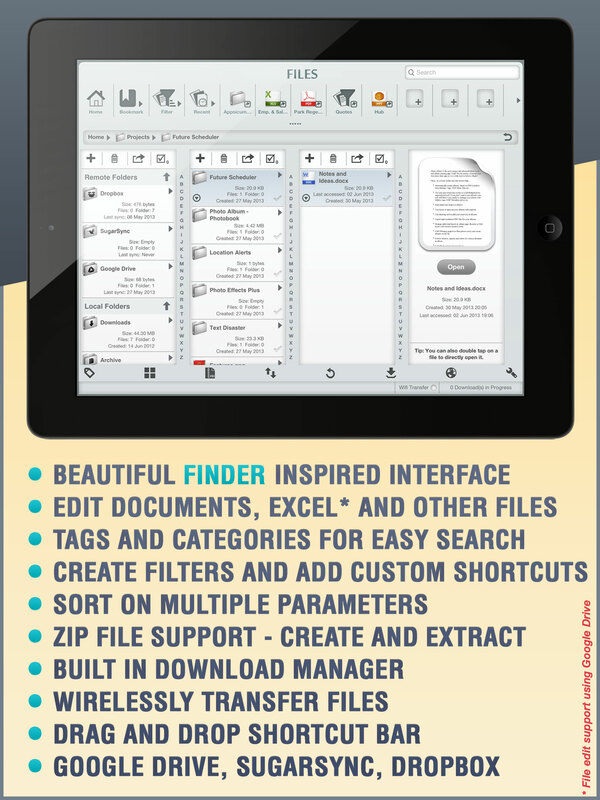 HomeWhy Files-Finder Edition is Best iPad File Manager to Manage Files on iPad? Why Files-Finder Edition is Best iPad File Manager to Manage Files on iPad? These days technology took new era and all people connected to each other via networks. Our family members, friends, office mates and relatives all can be meet on these networks and we can stay in touch with them always. However iPhone, iPad, Android phone all comes with compatible mode so that we can access social media accounts always. Like thus you keep update about happening outside from you. These days several chat messengers are available that are free of cost and easy to use. It might be interesting to know that what type of apps you have in your device. However, selection of apps varies according to device. This time you need to suppose about iPad that you are using for personal as well as professional way. What apps you should have in your iPad? 1. It has good old finder interface with gesture controls and fully touch screen optimization. 2. It has built in previewer for most of the file types. 3. It supports almost all types of files such as Doc, Docx, RTF, TXT, PNG, JPEG, MP4, Zip and many more files. 4. It can sync and used with Google drive, Dropbox and Sugarsync in the same interface. 5. It provides facility of documents editing such as Excel and other files using Google drive. 6. You can create custom shortcuts for frequently used files. 7. You can create filters and save them as shortcuts for easy handling. 8. It has functional address/ breadcrumb for easy navigation. 9. It has in built browser with bookmarks and file downloading support. 10. From security concern you can lock important files and folders. to type only a word in browser bar and you will redirect to Google, Dictionary and twitter. 12. It supports voice note creation. 13. You can transfer files via WiFi with password protection. 14. It provides accessibility to categorize item like Microsoft Outlook. 15. It has built in Zip creation and extraction so you can use zip files and folders easily. 16. It provides facility to share files via email, Facebook and twitter. 17. It supports tags so you can search files easily. 18. It has desktop like status bar. 19. It provides accessibility of bookmarks. 20. 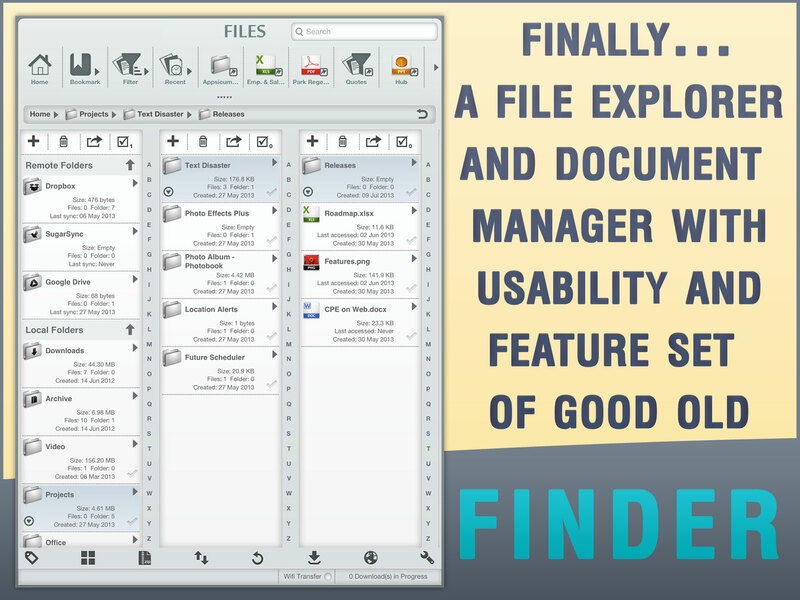 It provides searching and filters process easy so you can search files and folders by using multiple sorting parameters. 21. It supports searching and filters via tags, File types, File Size, Date and Categories. If you want to get more information about Files-finder edition, then visit https://itunes.apple.com/us/app/files-finder-edition/id733259837?mt=8 or you can visit http://appsicum.com/. Appsicum team also developed future scheduler, Location alert, Text disaster, photos to albums and photo effect plus app that are much popular among app lovers.